The facility seats 5,200 fans for basketball events, with chairback seating on both the lower and upper levels. Bleacher seating is also available in the student section on the lower level. 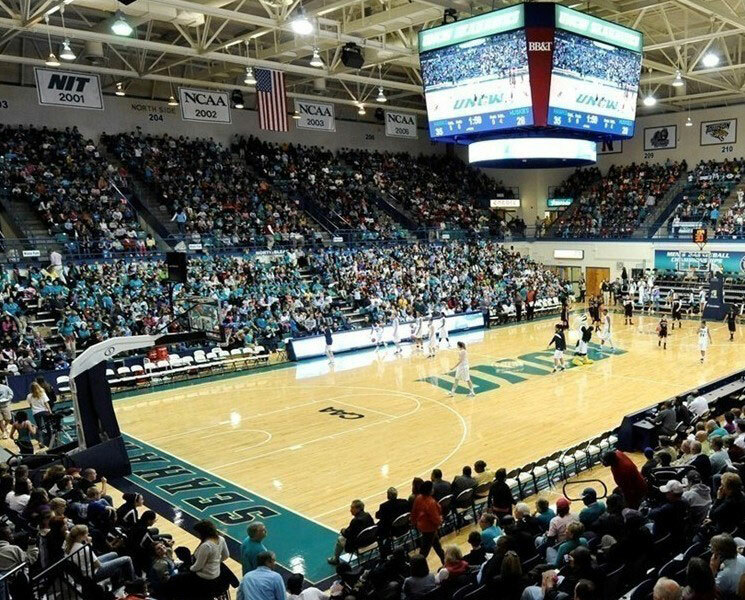 The arena was officially dedicated on Nov. 26, 1977, when the UNCW men’s basketball team battled Wake Forest before a sellout crowd, losing to the nationally-ranked Demon Deacons, 83-79. It was also the site of the Seahawks’ inaugural Colonial Athletic Association victory when the team edged George Mason, 66-64, on Jan. 5, 1985. The facility is a versatile one, serving as the home floor for the men’s and women’s basketball teams. It contains three general classrooms, one lecture classroom, a physical measurements laboratory, home for the Academic Support Services Center and faculty and administrative offices. Recent improvements have kept the arena in excellent condition. A $2 milliion renovated project as completed in the fall of 2011, including the installation of an impressive video board and LED courtside boards, and new LED lighting was installed in the fall of 2013. The 1986 women’s basketball and 1996 women’s volleyball championships for the Colonial Athletic Association were conducted at the facility. In 1998, Trask Coliseum was the site of a Federation Cup women’s tennis semifinal match between the United States and France. Several of the world's top-ranked women's professional players convened on Wilmington for the ESPN-televised event. Two National Basketball Association teams have held their training camps at the venue. The Washington Wizards called Trask Coliseum their pre-season training for three seasons from 2001-03 and hometown favorite Michael Jordan was a familiar site on campus for those training sessions.Most recently, the Charlotte Bobcats (now Hornets) trained at Trask Coliseum. Numerous concert and stage performers have also appeared in the arena, including Bill Cosby, Bob Hope, Frank Sinatra, The Oak Ridge Boys, Alabama, Kenny Rogers, Charlie Daniels, The Righteous Brothers, The Beach Boys, The Four Tops, Willie Nelson, Gladys Knight, and, most recently, country star Brad Paisley and Jessica Simpson. The Wilmington area, one of the fastest growing deep water ports on the East Coast, combines its economic potential with an abundance of outdoor recreational opportunities to offer a relaxed, gracious way of life. Wilmington has a historic legacy that begins before the Revolutionary War and runs through its stance as the last Atlantic port open to blockade runners during the Civil War. Today, the continuous restoration and preservation in the Historic District is a tribute to the city's proud heritage. Historic Wilmington affords visitors the unique opportunity to enjoy a bustling seaport rich in shopping, dining, culture and the arts, while being only minutes away from barrier islands, broad beaches and the intra-coastal waterway.